Ales Ude (Jozef Stefan Institute), coordinator of the ReconCell project, presented the result of ReconCell at the workshop “EC Success Stories” organized by Cecile Huet, Deputy Head of Unit Robotics & Artificial Intelligence. The European Robotics Forum offers over 50 information-filled workshops with presentations by leading European experts from industry, business, and top-level academia, as well as relevant European policy makers. For the ReconCell project, the best event to disseminate the final results of the project. Edgaras Leicher, CEO of LTRoboticshares the experience of their journey as an Digital Innovation Hub in the ReconCell EU project. Since the start of the project LTRobotics enjoyed great progress through the participation in the ReconCell EU project, including streamlining of services and value propositions, as well as initiating international collaborations. 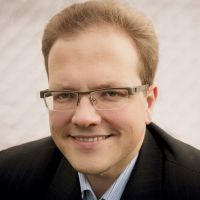 Triggered by the EU initiative I4MS and the ReconCell project, LTRobotics build a portfolio of success cases and took the role of a strong regional player in Lithuania. The project enabled them to “glue up” a local ecosystem and deliver complex solutions to local customers. They initiated an internal cooperation model for scaling up and attracting new members. 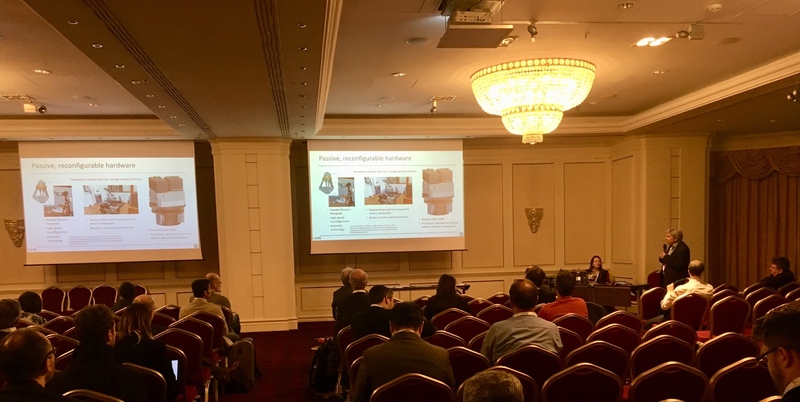 The European Commission and the euRobotics association encouraged the LTRobotics to disseminate ELVEZ as a use case of ReconCell in various EU events and to participate in roundtable debates on industrial robotics and smart manufacturing. This allowed LTRobotics to get experience on a fast track and improved their business model and processes to become a regional influencer and an international collaborator. Digital Innovation Hubs are crucial for the dissemination of knowledge and accelerates the European path towards Industry 4.0 and 5.0 innovations. Please find further information and the link to the original article here. Consumers demand for customized products, driving the need for more automation in factories. Machine vision can be used for purposes to serve the demand of high product quality and to reduce product recalls. Encompassing a large number of technologies, software and hardware products, integrated systems, actions, methods and expertise, the Vision System Quality Control is able to localize small items and identify even minor detail product damages. The application of machine vision can be relevant for several kinds of industries. In the pharmaceutical industry vision inspection can help to sort out broken or partially formed tablets before sending them out to the end-consumers. This ensures constant product quality and avoids product damages. In high performance manufacturing plants, machine vision is used to ensure products and components that fall off the production line adhere to quality, safety and production guidelines. Machine vision, also, enables flexibility within the production of different products and helps businesses to ensure that their product and component assembly standards are being enforced. I4MS is happy to announce the launch of the I4MS Partners Search space. A place to find the right partners to participate in the Open calls of AMable, Cloudifacturing, MIDIH and L4MS. This space has been created with the aim of connecting different entities and members of the value-chain to submit proposals as consortium. I4MS invites you to share information about your project idea and the type of partner you are looking for. 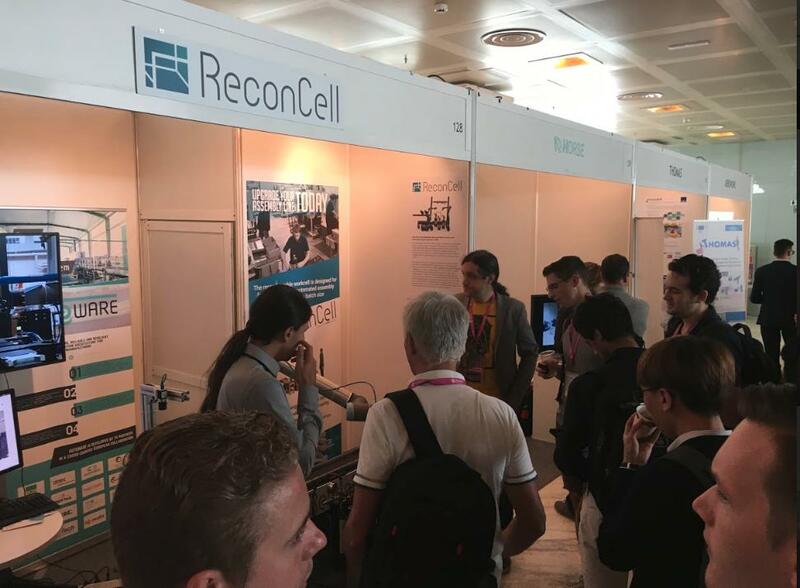 At the IROS 2018, the International Conference on Intelligent Robots and Systems, ReconCell had an exhibition booth to show the latest developments on innovative reconfigurable robotic cell design. The conference took place in Madrid, from 1-5 of Oktober 2018. A team of researchers from ReconCell partners Jozef Stefan Institute, University of Southern Denmark and Blue Ocean Robotics participated in the conference and demonstrated project results to a large number of conference attendees and visitors at the ReconCell exhibition booth. 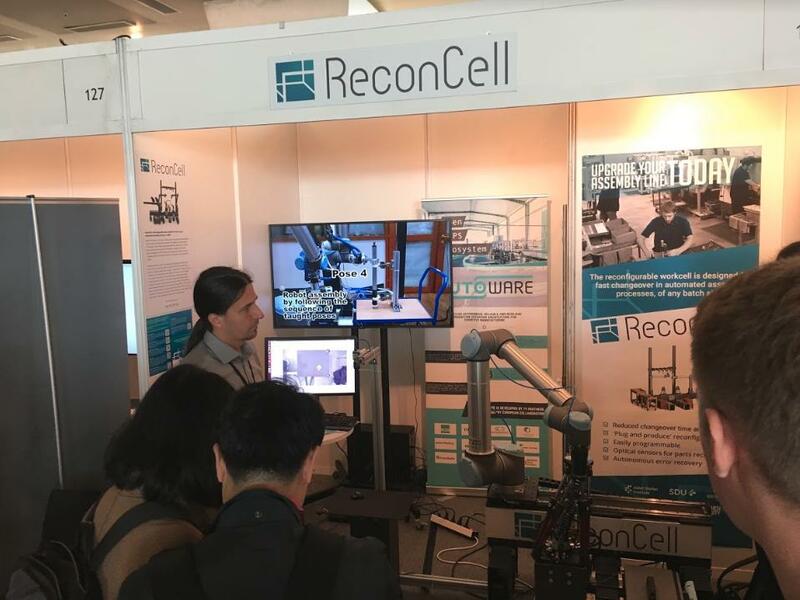 At the exhibition booth visitors had the chance to discussing the ReconCell set-up in particular on latest developments on vision localization, passive reconfigurable fixtures stemming and passive robot base linear rail. This enabled the ReconCell team to gather constructive feedback and new ideas for further development for their reconfigurable workcell. We generated a lot of interest. The workcell demo very reliably. Planning and optimization of complex manufacturing systems with Digital Twins. Recently, simulation has increasingly gained attention within the Manufacturing Industry. It has become one of the most effective solutions to facilitate planning and optimization of complex manufacturing systems at low costs. Shorter product life-cycles in few-of-a-kind productions require flexible ways to change production lines and to reconfigure manufacturing processes to allow manufacturers to focus on the product quality. Simulation is a key technology to plan setup, reconfiguration, programming and control of flexible work-cells using standardized components for a given production task. VEROSIM as an expert 3D simulation technology supports businesses to introduce new technologies and helps to align these with internal processes and systems. Digital Twins created with VEROSIM combine different engineering aspects that integrate into Virtual Testbeds: mechanical layout, actuator placement, control schemes, robot dynamics, sensor simulation etc. This facilitates interdepartmental collaboration and optimization of operational sequences. Digital Twin of a ReconCell in a VEROSIM Virtual Testbed with metaphors for user interaction. The (re-)configuration and (re-)programming of a ReconCell for the production of various products. Real-time status monitoring and aggregation of information for offline optimization. Planning and execution of assembly processes in a physical work-cell. Evaluation of robotic motions to optimize the production process in terms of cycle-times and operator convenience. Virtual Testbeds for process simulation at the system level for evaluation and optimization of work-cell operation. Virtual Commissioning of work-cells prior to physical assembly. Real-time status monitoring and control of actuators. Meet the ReconCell project at IROS 2018, one of the biggest knowledge exchange communities for researchers, companies and end-users on Intelligent Robots and Systems to discuss the latest technology in the area of reconfigurable workcell design. The conference will include plenary and short keynote presentations, contributed papers sessions in a mixed interactive format, workshops and tutorials, exhibition with live demos, and several forums as well as entrepreneurship and educational activities to share the latest facts and look at the newest robotic technologies from different angles. In the near future our lives will be changed by creating new human-robot relationships which will lead to a new robotic society. Therefore, the theme of the conference is “Towards a Robotic Society” and focus on topics including, human-robot interaction, social robots, autonomous systems, intelligent perception as well as on societal aspects (legal issues, regulations, robotics ethics, human–robot co-existence, employment). 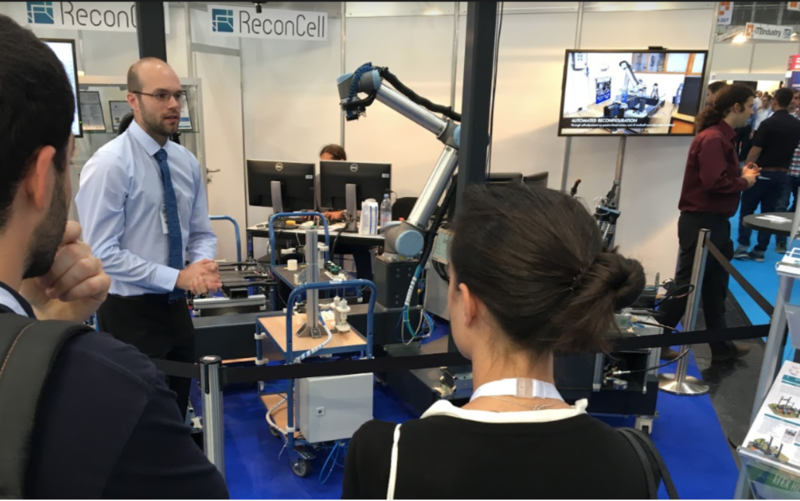 From June 19-22, 2018, the ReconCell project had the opportunity to present its reconfigurable workcell for fast setup of automated assembly processes at Automatica, the leading Fair for Smart Automation and Robotics in Munich. By demonstrating two of its use cases, visitors could experience the practical usability of the autonomous workcell live. After only 3 years of research and innovation, ReconCell was able to present the autonomous assembly of two different automotive headlights (use case 1) as well as the reconfiguration process to the second use case, the assembly and customization of drive systems and control boxes. The live demo also showed the workcell’s ability for safe human robot collaboration. Also, in the robot demonstration, ReconCell presented its innovative design of reconfigurable fixtures, which are elementary to create flexibility in autonomous assembly solutions by adopting to any geometrical batch size within seconds. Parts of the workcell were connected through the plug-and-produce interface. It is a practical solution to introduce new workpieces to the autonomous workcell, a key element to foster Artificial Intelligence. 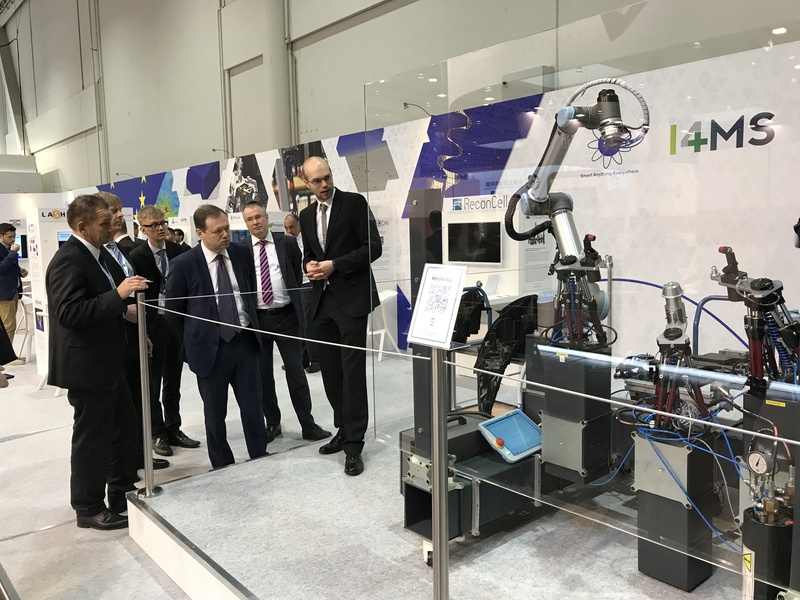 ReconCell was very satisfied with the input from the Industry 4.0 community at Automatica.The feedback enables ReconCell to gain new valuable insights on potential future customers, new use cases and the product roadmap for the ReconCell set up. Based on this, ReconCell is very much looking forward to improving the quality of its existing products and work with recently connected collaboration partners in the future. Discover new opportunities for optimizing your production line with ReconCell at Automatica fair in Munich, Germany, from June 19-22, 2018. 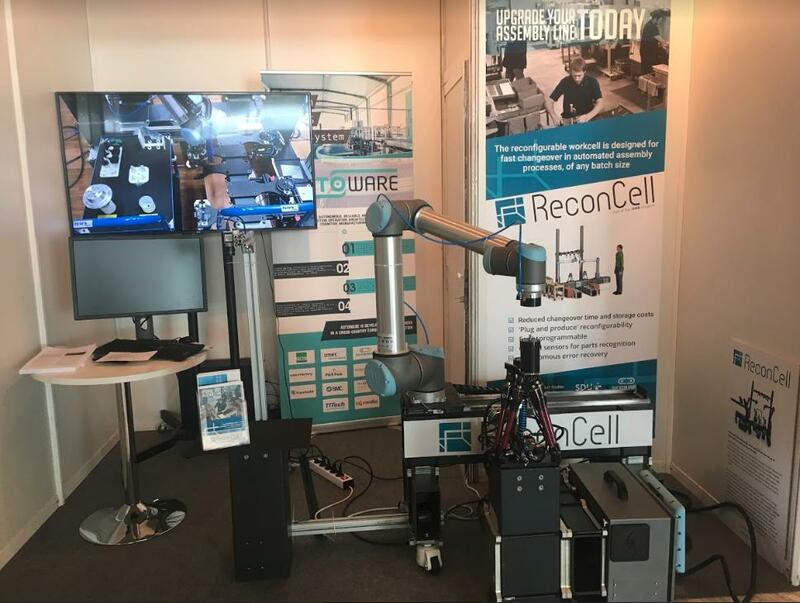 At the fair, ReconCell will present some of the key elements of its reconfigurable workcell for fast setup of automated assembly processes of any batch size. A robot demonstration of an example reconfiguration process that supports fast changeovers of product types will be shown every day at 2 pm. Besides the robot demonstration, ReconCell will present its design of reconfigurable fixtures, a simulation system for setting up new assembly processes, and an innovative plug-and-produce interface. ReconCell at Hannover fair 2018. As an SME within the EU you have now the chance to participate in the EU project ReconCell (Reconfigurable automated assembly workcell). This Fall (2017) there will be an Open Call for interested companies, that would like to share their manufacturing challenges and have their product assembled by the ReconCell workcell. A more specific Open Call description, including examples for application experiments, will be published in the following months. ReconCell, together with I4MS, will provide webinars to prepare potential applicants for the application process. ReconCell invites all manufacturing SMEs to apply for the Open Call. All SMEs that meet EU criteria for participation in the project will be evaluated. The main evaluation criteria will be quality and efficiency of implementation as well as potential industrial impact. The timeframe for the experiment will be up to 3 Months, with a financial framework of up to 85,000 Euro allocated for supporting the SME´s participation in each experiment. Over the last few years the automation investment decision process and buying behavior has been changed significantly. Manufacturing companies with easy access to vast amounts of information, are now much more empowered and knowledgeable. They became driver of investment decisions and contribute on solution development process. In this environment, collaboration with buyers has been considered as an effective selling methodology and mindset where providers as trusted advisors, assist the buyer in identifying needs and offering solutions within their relationship. The web-based digital platform, BATool, is used to connect a robotic solution with its potential customer base at an early stage, to support providers in the initial customer communication. BATool will help a provider to coordinate knowledge and communication between partners, to reduce the lead maturity complexity, facilitate project documentation, avoid missing information of projects and decisions, geographical market expansion and minimize unnecessary traveling. This will make a provider competitive on the market compared to other industrial robot suppliers. The BATool was recently tested in Hannover Messe 2017, in Germany. The BATool campaign module included during the test two robotic solutions: ReconCell and FlexHex. The intend was to present the advantages of ReconCell and Flex Hex using the online collaborative environment of the BATool. Thus, assisting the users to calculate their business case of using the robotic solutions. Moreover, the system was also set to gather information about Open Call applicants by requesting prospects contact information and scenario specifications. The gathered data was then forwarded with an online routing in the backend architecture to the back office for further evaluation. For Flex Hex we used the BATool to give visitors the possibility of gaining greater insight to the product and identify their need. 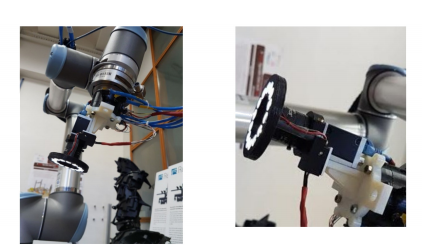 Visitors could get access to videos, photos, specification and calculate their ROI if they integrate the Flex Hex Robot comparing to their existing solution. All this, just by scanning the brochure or the QR tag on the stand. This provides great flexibility if don´t have possibility to get a one-to-one contact to the visitor. For us, it gives the possibility to registering whom have visited our stand and now we can take the dialogue onwards. BATool provides a collaborative environment by its online forms, checklists, product illustration, workflow calculators etc. ; and by utilizing this the BATool assists a potential customer in evaluating requirements and the viability of robotic projects. We look forward to running the BATool at more exhibitions and campaigns and for more products in the future. 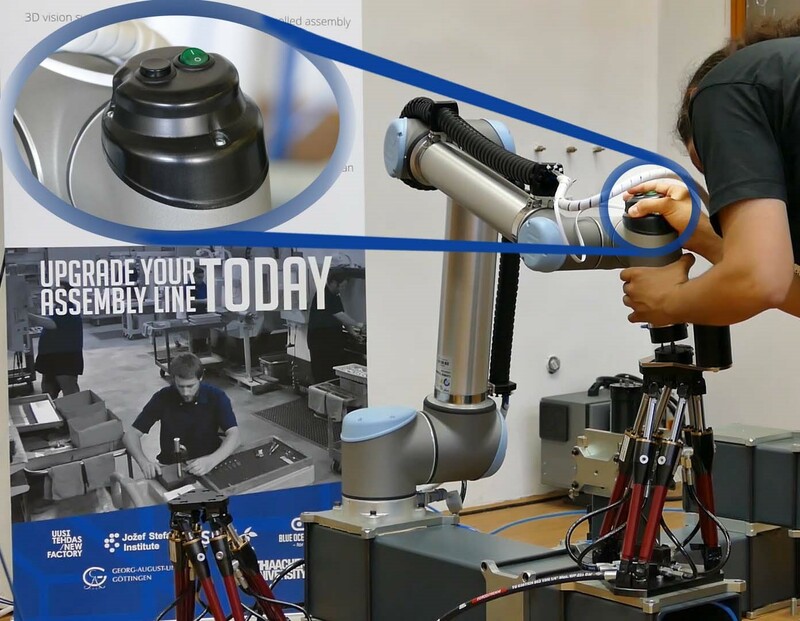 In the last 5 years, a method for learning fingers for industrial grippers has been developed in a co-operation between SDU-Robotics and Bialystok Technical University. 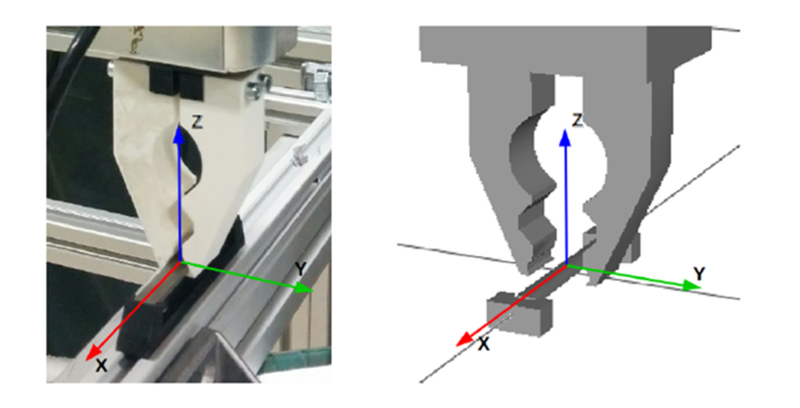 By this method, cumbersome work on gripper generation, which is a severe obstacle for the fast set-up of robot solutions, could be transferred to simulation. A. Wolniakowski, A. Kramberger, A. Gams, D. Chrysostomou, F. Hagelskjær, T. N. Thulesen, L. Kiforenko, A. G. Buch, L. Bodenhagen, H. G. Petersen, O. Madsen, A. Ude and N. Krüger. Optimizing Grippers for Compensating Pose Uncertainties by Dynamic Simulation. IEEE International Conference on Simulation, Modeling, and Programming for Autonomous Robots 2016. A. Wolniakowski, K. Miatliuk, Z. Gosiewski, L. Bodenhagen, H. G. Petersen, L. C. M.W. Schwartz, J. A. Jørgensen, L.-P. Ellekilde, N. Kruger. Task and Context Sensitive Gripper Design Learning Using Dynamic Grasp Simulation. Accepted for Journal of Intelligent and Robotic Systems. Calibration between cameras and robots is a difficult problem in many robot vision applications. At University of Southern Denmark we have been busy developing a new method for full automatic workcell calibration. The method we have developed is very user-friendly in the sense that the user is not required to know anything about calibration, cameras and robot control, and the user will be able to calibrate an entire workcell only with the click of a button. In the ReconCell project the userfriendliness of the calibration method is of great importance, especially when the workcell has been reconfigured to solve a different task, then it might also need to be re-calibrated. The method calibrates the extrinsic parameters of the robot and camera, while it also calibrates the intrinsic parameters of the robot which includes the full Denavit-Hartenberg parameters and Encoder offset. The calibration method supports multiple types of cameras. You can calibrate both stereo and mono cameras. Multiple types of robots are also supported. Currently we have tested the method with UR5, UR10 and KUKA LBR iiwa. We are now working intensively to extend the calibration method to also support camera-in-hand calibration, where the camera is placed in the robot hand instead of a static placement in the workcell, which is important for quality inspection applications. Several innovations are being developed, implemented and tested as part of the ReconCell project. Reconfigurable fixtures that use a passive Gough-Stewart mechanism enable several different workpieces to be manufactured in the same robotic workcell. The frame of the cell is made of square steel beams connected by special joints. The joints are very stiff, require no welding and are disassemblable. Peripheral application specific elements can be added to the cell using the plug and produce connector. The connector transmits power, Ethernet and pneumatics as well as providing mechanical coupling. An innovative linear unit enables the motion of the robot base. It is unactuated therefore the motion is powered by the robot itself by attaching it’s tip to a fixed point. This significantly reduces costs as no actuators or measuring equipment is needed. The innovative concepts show great potential in making robotic cells modular and reconfigurable. To further confirm the benefits of the proposed innovations more use cases from different industrial backgrounds have to be tested. The developments are getting more and more interesting, so this blog will become more active in the following weeks and months. We plan to keep you up-to-date with our latest results and more information about what's new in the project. The main results of the first year include a novel reconfigurable hardware design and software architecture for automated robot assembly. 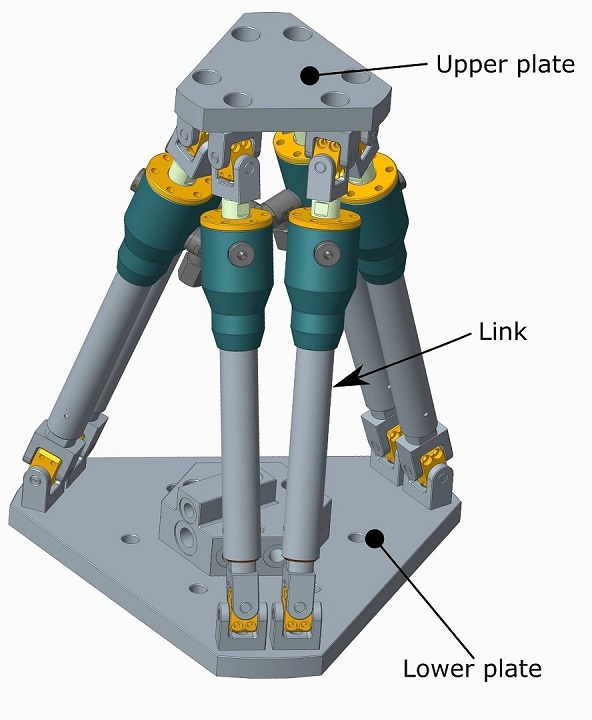 We developed new fixtures called hexapods, which are unactuated Gough-Stewart platforms with six degrees of freedom. They have raised great interest at the Automatica 2016 fair in Munich (http://automatica-munich.com/). These fixtures are the building blocks in our novel modular and reconfigurable frame design, which allows easy adaptation of the workcell configuration. Another feature contributing to easy reconfiguration are also the new plug & produce connectors that standardize how a group of modules is connected. Further components that contribute to cheap and automatic reconfiguration are the novel passive linear units that allow us to increase of the robot’s work envelope significantly. We showed in our concept that our workcell can be partially automatically reconfigured to a variety of configuration and use cases. To drive the passively reconfigurable hardware elements with the robot and carry out a variety of assembly tasks, we developed a ROS-based software architecture that supports communication between all hardware components. It consists of several ROS nodes that implement the basic communication infrastructure and user interfaces. Other nodes can be added based on task requirements, for example “vision module” and “digital interface unit”. 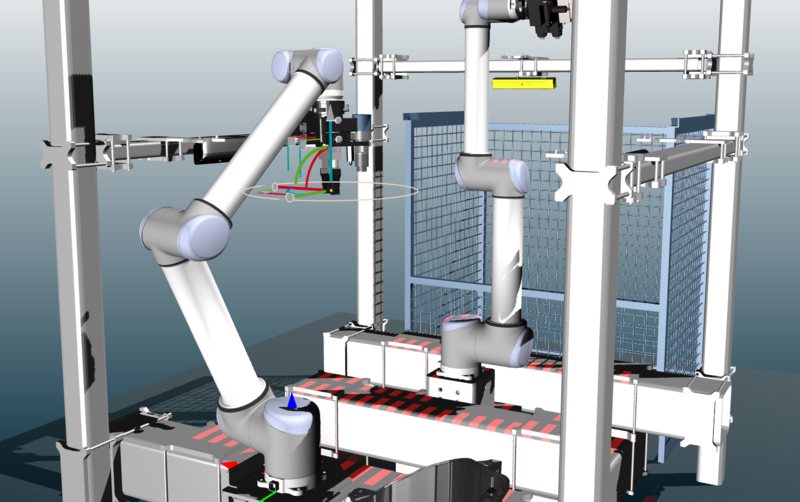 A special Simulink-based real-time server was developed to enable efficient robot control. Besides standard industrial trajectory planning technologies, our workcell supports also new advanced trajectory planning techniques based on dynamic movement primitives. These are the basis for learning and adaptation technologies supported by our system, which are essential to increase the number of tasks that can be accomplished without extensive additional programming. Currently we are applying our system to a number of use cases provided by the industrial partners of the project (ELVEZ, Precizika Metal, LogicData). Stay tuned for more news about exciting new assembly tasks that can be accomplished by the ReconCell. 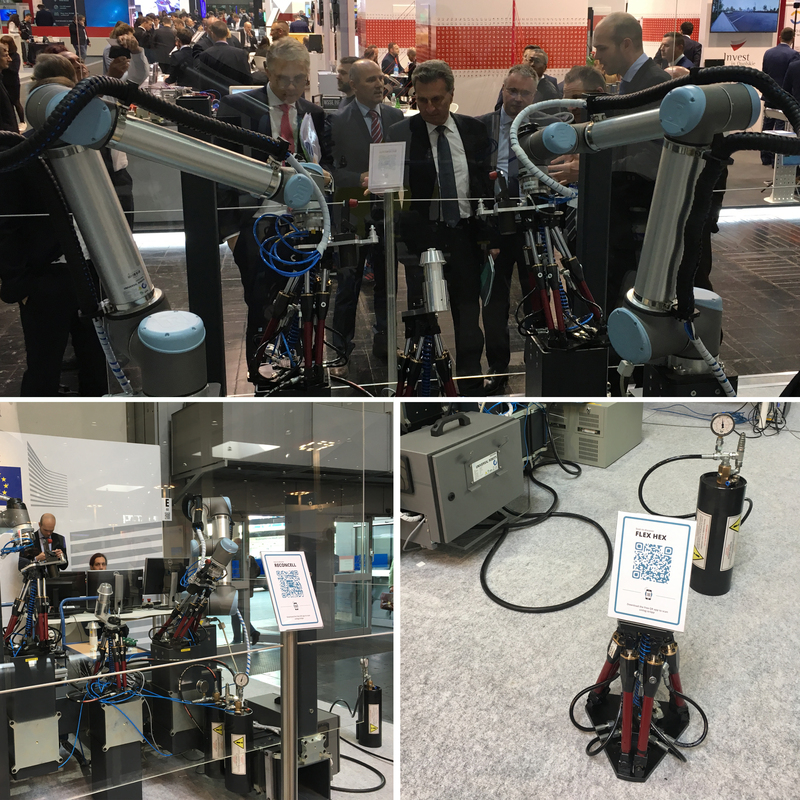 Here you can see the video from our booth at Automatica, where the robot successfully reconfigures the hexapod and inserts a peg into the hole. This is done using advanced control methods that use the forces that occur during insertion to adapt robot motion. This year Automatica (Int'l Trade Fair for Automation and Mechatronics) takes place in Munich, Germany, from June 21st-24th. At the fair ReconCell will present some of the key elements of its reconfigurable workcell for fast setup of automated assembly processes. 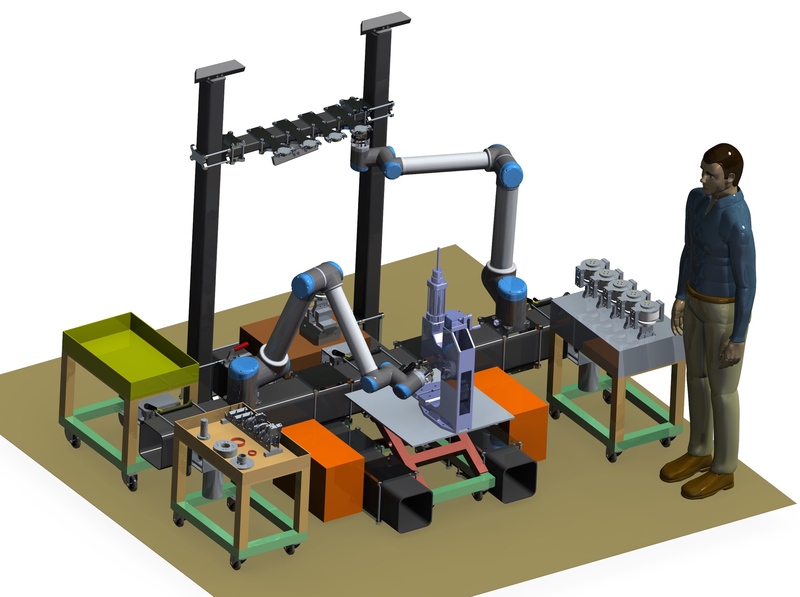 A robot demonstration of an example reconfiguration process that supports fast changeovers of product types will be shown. Besides the robot demonstration, ReconCell will present its design of reconfigurable fixtures, a simulation system for setting up new assembly processes, and an innovative plug-and-produce interface. Robots as highly flexible devices have been successfully utilized in many industrial production processes. However, companies are still reluctant to employ robots for many types of tasks. The main hindrances are complexities involved in setting-up robot-based automated solutions because these usually require expert knowledge and also significant time for testing and fine-tuning. Looking at robotic systems in more detail, we can recognise that these problems are due to the long time needed to re-configure and reprogramme the robot workcell for a new production task. The goal of this workshop is to find out how technologies such as efficient robot programming, sensing, and passively reconfigurable elements can contribute to faster set-up times of robotic workcells. We plan to make the round table discussion available either in video form or as a short report available on the workshop webpage. The results of the workshop will elucidate what technologies are needed to shorten set-up times of robotic workcells and where more research is needed in the future.